Internet Explorer (IE) was by no means the first web browser available – that honour goes to NCSA Mosaic in 1993 – but is definitely the most well-known, for a while the most used, and for the longest time the most disliked browser by those who have to develop for browsers. The reasons for the toppling of Internet Explorer from the World Wide Web throne are many, but mostly it comes down to the browser not remaining relevant against looming competition. Internet Explorer 6 was the most widely used browser in 2003, most likely because it was installed with Windows XP as the default. For many people, the blue IE logo was just the button for the Internet. Plagued with security concerns for years by 2011, amidst a minority (but still significant) user base that simply wouldn’t upgrade, Microsoft launched a campaign to educate users to upgrade their browser to a newer version of IE. For the following years, Microsoft kept upgrading their browser five more major versions, each being more secure and conforming to more web standards than the last. For web developers though, the race was already over – Chrome is now the dominant browser. But Microsoft is fighting back. Meet Project Spartan, the codename for the new browser from Microsoft. It is not yet known if the Internet Explorer branding will be kept, but the new browser is expected to ship with Windows 10. Created with a completely new rendering engine “Edge” beneath the hood, Microsoft states that Spartan is designed to work across all Windows 10 devices; be it desktop, tablet or mobile using “touch, gestures, voice, controllers and sensors”. It will update as a service (presumably similar to how Chrome and Firefox automatically update) so that we never again get another IE6 situation on our hands. Spartan’s new rendering engine is designed to work with the way the web is written today. Compatibility with existing websites is key, and Spartan promises to automatically detect which rendering engine – Edge or IE11 – is required and adjust accordingly. However, websites that rely on old document modes will not be given special treatment i.e. if they don’t render well in IE11 now without pressing the Compatibility button, then they won’t render well in Spartan. Time to upgrade your website. Microsoft promises better adherence to standards and proposed standards. You can keep up to date with what will be supported, and more importantly weigh in your own votes to what HTML, CSS, JS and other standards should be supported as the website modern.ie. Spartan will feature a new and improved Developer Tool (found in your current IE by pressing F12) that should make debugging mark-up, scripts and performance easier. Brand new features such as note-taking tools and live annotations, and the assistance tool Cortana – which will provide helpful information relevant to the website you are viewing, such as maps and directions will be key items Microsoft will use to push its browser ahead of the pack. Over twenty years, Microsoft has learned a lot of valuable lessons in the browser game. With what we know so far, Spartan looks like those learned lessons will result in a better browser. 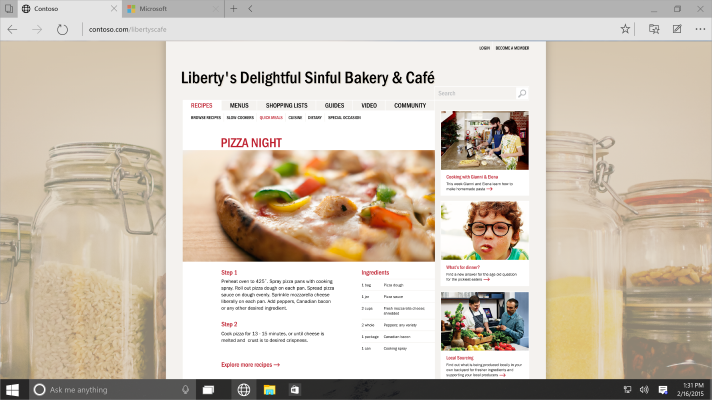 Let’s hope that Spartan proves to be Microsoft’s best browser yet. View Previous blog Responsive or adaptive ?